To say I love Fougasse is pure understatement. I adore Fougasse, I admire it. Some years ago I was working in Paris for three months and that's when I first saw and tasted it. Quickly I found my favourite Fougasse bakers: At the market on Blvd Richard Lenoir, near Bastille, every Wednesday and Saturday there is a stand (L'Ancienne Boulangerie) that has hillarious good ones with olives, ham or dried tomatoes. And I also like the ones from Aux Peches Normands at the beginning of Rue du Faubourg du Temple, between Place de la République and Canal St. Martin. Curiously, at "La Fougasse " (rue de Bretagne, one of my favourite streets in Paris, hosting my favourite market) you get a lot of excellent things, cakes, viennoiserie, desserts, baguettes - but not a single Fougasse or at least not one that should look like a Fougasse. They sell sort of stiffed bread as Fougasse. I had a bit trouble with shaping them, so the dough was thinner or thicker at the different parts of the bread. And, for sure, the Fougasse turned out thicker or thinner, more or less through, darker from baking or lighter. 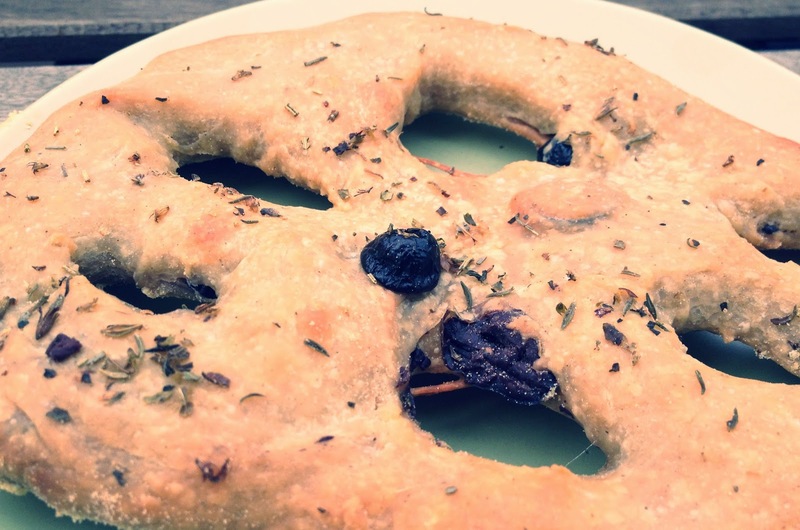 In Paris I learned a Fougasse is baked in a stone oven, what for sure I do not have, but the recipe also doesn't call for. 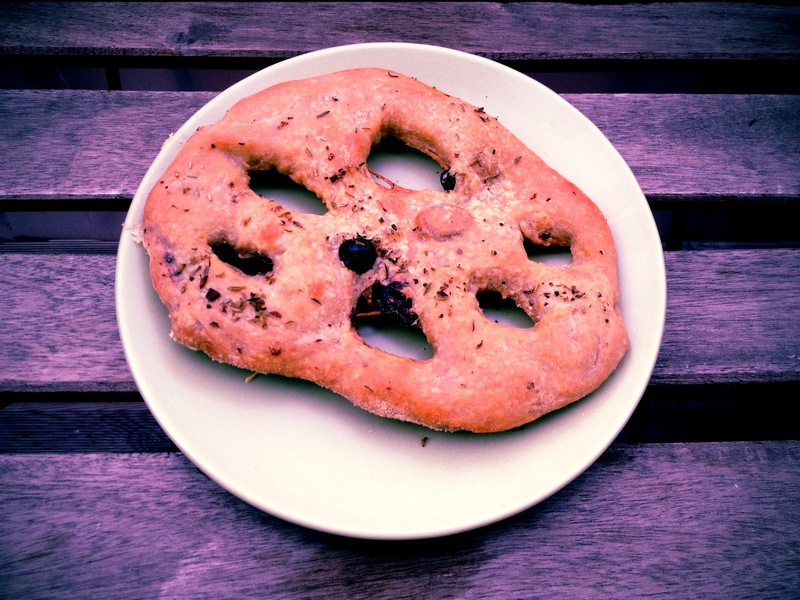 I made my Fougasse with black olives because that's how I liked them best. My Fougasse is a bit flat and more like a crispy snack. That's ok and I like it, but it is no Fougasse. I will give it another try, I am sure, because it is just too tempting. I hope the Fougasse turned out fine for a lot of people in the group so they get to love this bread as it deserves to be loved. Whenever you are in France - taste it! And until then: Buy the book by Dorie Greenspan, have a look at pp 146/147 and bake your own Fougasse. For hints, advice and inspiration have a look at how it turned out for the other TWD-bakers! This is my first time doing a fougasse, so I don't have a benchmark, but I loved this recipe. I love the idea of olives! How nice that you made this with olives. I have made Foccacia but never a Fougasse before, but I was expecting a more airy and open crumb which did not happen. next time I get to france (gosh, I hope that's soon! ), i'll have to remember to try real fougasse. black olives are a nice touch.